Other Products by Tribeca Health. Search other Health Supplements products. 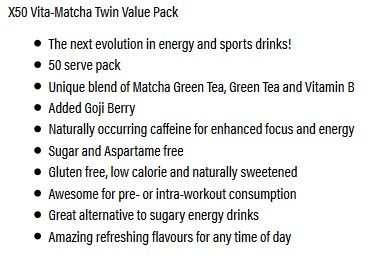 X50 Vita Matcha Green Tea is a flavoured green tea powder that contains both regular green tea, and also the special Matcha green tea powder. Though both forms come from the same plant, Camellia sinensis, Matcha green tea is sourced only from plants that have been grown in a specific way, which involves shaded-growth phases and processing with removal of plant stems and veins. Green Tea produced via this system has been shown to contain a great deal more L-Theanine and Caffeine, thus accounting for the energised calm that Matcha is synonimous for. Unlike coffee, which can cause jitteriness and even anxiety in some people, green tea can provoke an increase in energy, with less likeliness for side-effects and adverse symptoms—which is what we want! 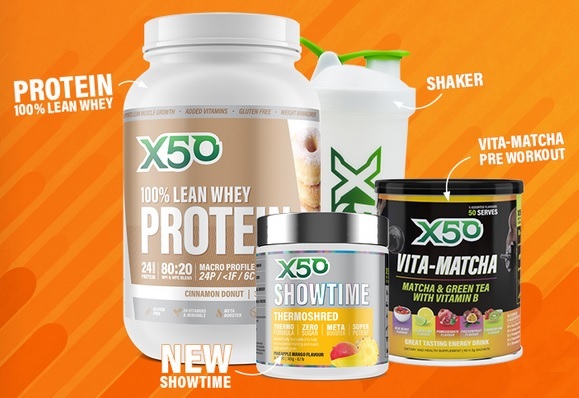 X50 Vita-Matcha is an excellent source of polyphenol antioxidants, particularly one called EGCG (epigallocatechin-3-0-gallate if you’re into long words), which helps to give the metabolism a nice boost. Research has shown an elevation in 24hr calorie expenditure from this nice natural chemical. In fact, Green Tea has one of the best evidence-bases of any natural compound or herb for gently supporting thermogenesis and fat-burning, making it helpful for weight loss programs and maintaining a healthy bodyweight. Green Tea is also well known in herbal medicine for its anti-viral properties, which may assist in overcoming colds and flues. In addition, some even believe it to be an excellent anti-cancer plant, as epidemiological research has shown it to be potentially helpful for preventing mouth, throat and stomach cancers. In addition to the already impressive properties of the Camellia sinensis plant, ascorbic acid (Vitamin C) and Goji Berries have been added to the formula to improve its antioxidant properties. Goji Berry is a fruit that naturally contains an array of impressive antioxidants. 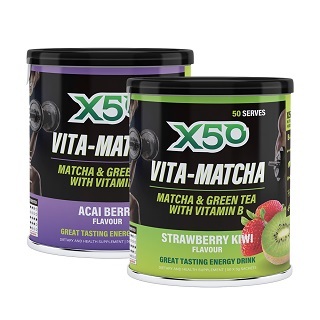 X50 Vita-Matcha also contains a Vitamin B complex, to help improve energy levels and stress tolerance, is naturally sweetened with Xylitol and contains only 8 Calories per serve. Even the strictest of diets usually have room for a mere 8 calories! This product comes in 5 impressively delicious flavours, including Lemon Lime, Mango, Passionfruit, Pomegranate and Strawberry Kiwi, which should satisfy even the most selective of palates. Add one sachet to 500ml cold water and consume one to two times daily. To assess caffeine tolerance, start with half a sachet. As this product contains 84mg caffeine per sachet, it may be best to consume before the afternoon so as not to interrupt normal sleep routines.